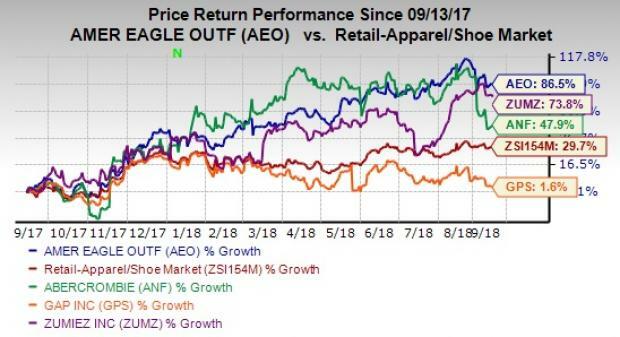 Shares of American Eagle Outfitters Inc. AEO have displayed a spectacular show in the past year and emerged as an attractive investment option. Notably, the stock has gained a solid 86.5% in a year, marking an outperformance compared with the industry’s growth of 29.7%. Overall, stocks in the Retail – Apparel & Shoes industry have been in good shape lately, driven by continued gains from increased traffic trends, backed by robust consumer confidence and sentiment. The industry is also reaping benefits of the ongoing transformation, with better merchandising — both in stores and online — as well as revamped marketing efforts. Companies are gaining from upgraded core technology platforms and enhancement of supply chain, alongside focus on cost-saving initiatives and investments in loyalty programs. We believe, there is still momentum left in the stock of this Pittsburgh, PA-based retailer of casual apparel, accessories and footwear, based on gains from strategic initiatives, and ability to boost market share through strong brands and compelling merchandise. This is further evident from this Zacks Rank #3 (Hold) company’s long-term impressive earnings growth rate of 8% and a VGM Score of A. Looking more closely at the stocks in the broader industry, we note that American Eagle is quite ahead of the peer group. Notably, stocks such as Abercrombie & Fitch ANF, Gap GPS, and Zumiez ZUMZ have witnessed gains of 47.9%, 1.6% and 73.8%, respectively, in a year. Let’s delve deeper and find out the reasons that are pushing American Eagle ahead of its peers. American Eagle has been displaying a solid comparable store sales (comps) performance over the last several quarters, which considerably helped in lifting investors’ sentiment on the stock. Second-quarter fiscal 2018 marked the 14th straight quarter of comps growth, with an increase of 9%. Comps have been gaining from the company’s initiatives to improve performance at stores as well as online. Notably, both American Eagle (“AE”) and Aerie brands reported positive comps across stores as well as e-commerce in the fiscal second quarter. Brand-wise, comps rose 27% for the Aerie brand, while it improved 7% for the AE brand. The AE brand is gaining from its leadership position in bottom wear, with jeans business recording 20th consecutive quarter of comps growth. Further, this marked Aerie brand’s 15th straight quarter (nearly four years) of double-digit sales growth, reflecting a significant momentum in all areas of the business. American Eagle is striving to develop its omni-channel platform to reach customers in every possible way. For this, the company is not only enhancing its digital presence but also investing in its store fleet. This was clearly evident from second-quarter fiscal 2018 results, where digital sales contributed about 24% to net sales. In fact, this was the company’s 14th straight quarter of double-digit e-commerce growth. Moreover, trends in brick-and-mortar stores continued to improve as both AE and Aerie stores reported positive in-store comps, increasing in a high-single digit. This marked the third consecutive quarter of positive in-store comps for both the brands. This makes it clear that providing the best combination of digital and physical store experiences is a successful marketing strategy in retail. American Eagle enjoys a strong financial status. The company had a debt-free balance sheet, with cash and cash equivalents of $323.3 million as of Aug 4, where it also generated healthy cash flows. These helped the company to make capital investments alongside returning excess cash to shareholders via dividends and share buybacks. Backed by its strong cash position, positive free cash flow and gains from the tax reform, the company returned nearly $24 million to shareholders through dividends in the fiscal second quarter.